Editor’s note: In between covering the spring classics, we are riding the sportives of Gent-Wevelgem, the Tour of Flanders, and Paris-Roubaix. This coverage is made possible by sponsorship from Pearl Izumi, Schwalbe, Stages Cycling, and Roll Massif. Bikes, bergs, and beers. These are a few of my favorite Belgian things. The day before Gent-Wevelgem, VeloNews editor Fred Dreier and I rode the Gent-Wevelgem Cyclo with 6,700 other cyclists to tackle the Flemish lanes, the gravel Plugstreets, and the steep and cobbled Kemmelberg. 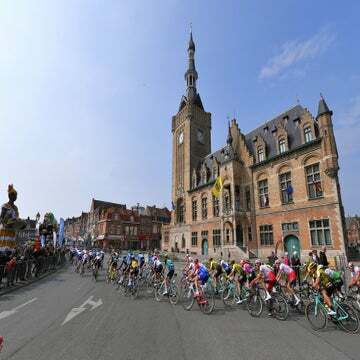 Just like the Tour of Flanders, Gent-Wevelgem supports its own mass-participant ride on the pro racecourse for amateur riders like you and me. As with many sportives, there is no specific start time at the Gent-Wevelgem Cyclo; you can roll out whenever you like. How else are you going to get nearly 7,000 people through such narrow roads? Since this is Belgium, enormous cycling clubs show up en masse with dozens of riders all in matching kit to race the Cyclo. These riders help form dozens of massive pelotons that speed along the winding, twisting roads. 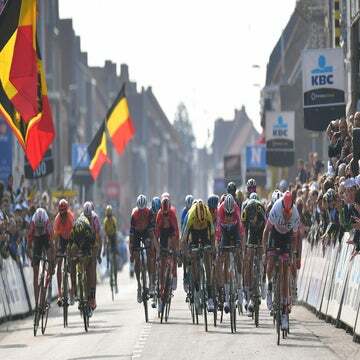 More than a decade ago, the Tour of Flanders sportive was the Belgian sportive. It’s still the biggest by far, with a cap of 16,000 riders. But in the last few years, Belgium has aggressively added a bevy of other amateur events: The Johan Museeuw Classic, Schedleprijs Cyclo, Brabantse Pijl Sportive, The Greg Van Avermaet Classic, The Retro Ronde Van Vlaanderen, and on and on. One thing I love about riding in Belgium is the seemingly endless array of quiet, narrow, winding roads. It feels to this American like the roadie equivalent of singletrack. Sure, you can ride more than one abreast, but the quick hard turns, undulating hills, and changing road surfaces keep you in the flow. Car traffic? Not really an issue. Tractors on the road, well, that’s another thing. With plenty of cobblestones and rough roads along the Gent-Wevelgem route, we opted for a pressure of about 85psi in our Schwalbe 28mm Pro One Tubeless tires. (Tire pressure is relative to body weight; we’re both about 185 pounds.) Tire width is also affected by rims, of course. Fred’s Zipps put his tires at a touch over 28mm; my 3T rims with a 25mm internal width plumped the Schwalbes up well over 30mm. Plush! Another thing I love about riding in Belgium — particularly in sportives — is how well people ride here. With a culture that not only embraces pro racing but grew up on bikes and uses them everyday (gasp) as normal transportation, people are entirely comfortable riding in close quarters. It is a far cry from your average American charity ride where many folks don’t want their wheels anywhere near anyone else’s. Oh, and waffles and chocolate in the feed zones? Of course there are waffles and chocolate in the feed zones. To go big, or to go home? Gent-Wevelgem Cyclo supports four different routes: 60km, 90km, 140km, and the big 215km ride. All of the routes begin with a section of fast and furious pedaling on winding roads out of Wevelgem. The pace felt like a fast Saturday race ride back home, and we surged from group to group, seeking shelter from the wind. We loaded the 215km route into our new Stages Dash M50 GPS units and prayed that we’d have the legs to survive the long route. When it came time to choose between 140 and 215km, we went for the full route and immediately found ourselves without the giant pelotons. Luckily, we had a couple of young riders who towed us along, plus local legend Dries Verclyte with us, who filled us in on all the places we passed, like the abbey that brews the coveted Westvleteren beer, the various WWI sites and monuments, and the best places to stop for a coffee, should we pass this way again. Eventually, the vigor of youth surpassed our ambition and we were left as a trio to battle the winds. One of the many nice things about sportives: they are not races, so who cares? It’s all about enjoying the day. Fred at one point had his shoe off, sitting on a curb while arguing with his derailleur. He wasn’t enjoying that part of the day. But soon enough the drivetrain and our spirits revived and we were rolling again, just in time for the Kemmelberg. With the cobbled climb kicking up to 22%, I was happy to have a 35/28 low gear with the new SRAM AXS on the 3T Strada Due I had borrowed. If I had a lower gear, heck yes I would have used it. It’s hard to take one’s recreational cycling pursuits too seriously in this part of the world. The Kemmelberg staged a hellacious WWI battle, and monuments to the war dead abound in the area. A few short turns from the Kemmelberg is the site of the famous Christmas truce between Germans and Brits, where a soccer match was played. Today the area is where hikers and cyclists play on the Plugstreets, the area’s fairly tame gravel roads. From there, as you probably recall from following Gent-Wevelgem, it’s just a few short kilometers back to the finish in downtown Wevelgem. Unlike the thundering finish by the front end of the WorldTour pack, our trio casually rolled in and made a beeline for the Kwaremont and frites trucks in the midst of the post-sportive party. Watching and covering Gent-Wevelgem the next day, the racing was brought to life that much more by having ridden many of the roads just hours earlier, at our humble pace. Want to check out the Gent-Wevelgem sportive yourself? You should! Visit cyclinginflanders.cc for details and inspiration on this and other Belgian sportives.